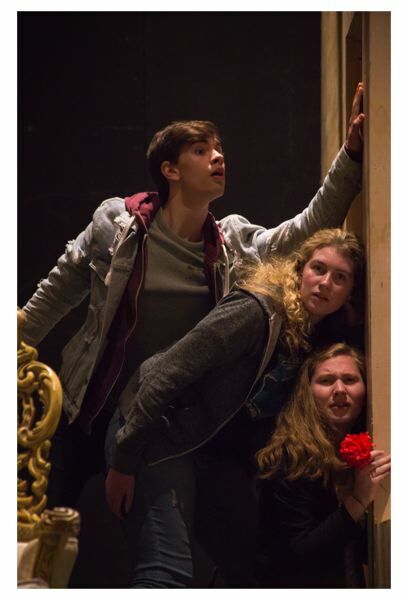 Grab onto your seat and prepare for an accelerating snowball of laughter when Ken Ludwig's comedy, "Lend Me a Tenor," opens at 7:30 p.m. Thursday, April 19, at Sam Barlow High School. "This is one of my favorite comedies and some of the most fun I've had directing," says director Jeff Schroeder. "When one person thinks one thing is happening, another person thinks something else. We're always laughing — the script is so great." Famed tenor Tito Morelli is to sing the lead in "Otello" for Cleveland Grand Opera Company, a comedy of mishaps ensues, leading him to accidentally take a double dosage of tranquilizers. His pulse is so low that General Manager Saunders and his assistant Max believe he's dead. Insistent that the show must go on, Saunders enlists the help of an impersonator, Max, spurring laughabable mistaken identities, mixed signals and misunderstandings. Max succeeds admirably, but Tito comes to and gets into his other costume, ready to perform. Now two Otellos are running around in costume, and two women are running around, each thinking she is with Tito. "There are all of these crazy moments and innuendo on stage," Schroeder says. "One of the more difficult things with this play is the timing and the dialogue. This cast has been rising to the challenge." Barlow's production features a cast of four boys, four girls and 10 crew members. The hilarious farce is set during 1934 in a hotel suite and showcases 1930s-era costumes. One side of the stage features a sitting area, while an imaginary wall separates it from a bedroom so that audience members can observe everything happening. The set includes six doors with actors running all over the place. Senior Sammy Guadarrama plays Tito Morelli, the worldwide star and tenor of the opera. "He's very manly, and his ego's very big," Guadarrama says with a laugh. "He sings around the world and he's very talented in what he does." As Saunders, the opera house manager, senior Seth Reynolds says he's always scurrying about the stage stressed. Reynolds describes his character as a "stern, grumpy old man." Senior Sam Smith plays Max, the assistant to Saunders who is engaged to his daughter. His character has always yearned for a chance, whether it's a moment in the spotlight or with his fiancee. "Even though the show is over-the-top, there are a lot of morals and things to be learned," Smith says. "For Max, he learns that if you never take that chance, you may never get it again." Lexi Cheney, a junior, plays Maggie, Max's girlfriend and the daughter of Saunders. After meeting Tito once, she fell in love and is thrilled to meet him again. Things get complicated when Max dresses up as Tito. "This show is incredibly hilarious — it'll brighten your day," Cheney says. Senior Ben Kalinkin's character of bus boy is also smitten with Tito. "You find him making these interesting interactions in odd but comedic ways," Kalinkin says. "He's like this lighthearted side character that brings a glow to the show." Schroeder says the play is not a musical, and he recommends audience members be 12 and older. "The show is full of physical comedy and hilarious lines," Schroeder says. "At the end, a fun thing we do is run through the whole play with music playing in a speed version." What: Sam Barlow Theatre Department presents "Lend Me a Tenor"